It appears that the rainy season is behind us and fortunately, the rain that fell helped to fill our reservoirs without creating the major issues that we saw during the previous rainy season. Although we are probably safe from storms for the near future, that does not mean that you can drop your guard against water damages that may affect your home. The impact that water damages have in your house are influenced by a number of factors and one of the major ones is the speed with which you are able to attend to the problem and get things dried. Speed is of the essence in this situation. Water damages definitely do not get better with age. As you can see, the damage that water can cause escalates quickly. When you find yourself in a situation where your house needs to be dried quickly, give SERVPRO of Santa Barbara a call at 805-963-0606. Water to drink is great. Water in your carpet is a bummer! One of the facts of life is that the Earth is filled with water. Unless you live in the desert, you are never far away from oceans, lakes, rivers or other natural bodies of water. As it happens, you are also surrounded by man-made bodies of water too. If you are in a community, you will never be far from sewers, water mains and water pipes, sprinklers and fountains. Water is great and necessary for life but it also has the potential to cause a lot of damage. Here at SERVPRO of Santa Barbara, we have run into just about every different way that water could do harm to your home. The water may find plenty of ways to do damage but we will always have only one goal; to get your house to dry quickly and efficiently. Get any of your possessions that are sitting in water out, of the water. Wet furniture can leave stains on your carpet, wet clothing can begin to get moldy, and wet carpet can start to delaminate. The sooner you can get your stuff to a dry place in your home, the better. If there is any significant volume of water from any water intrusion, you need to have the water extracted. Standing water will only make the situation worse and slow the time required to get your home dried out. Have your home inspected by a water damage expert. Technicians from SERVPRO of Santa Barbara will have the latest technology with them, such as penetrating and non-penetrating moisture meters or infra-red cameras so that they can verify that the water did not go deeper or try to hide where you can not see or feel it. Of course we hope that you never have to deal with a water damage in your home and, if you do, that it will be minor and easy to deal with. In the case where it is not simple, remember that SERVPRO of Santa Barbara is always available to take a look or to offer assistance. We do not charge for estimates or second opinions or inspections so please feel free to contact us at any time to get some expert advice. Call us at 805-963-0606 or email us at office@SERVPROsantabarbara.com. SERVPRO of Santa Barbara just returned from an assignment in Minnesota which was about as different as could be for these boys from warm and sunny Southern California. Rain and melting snow had filled the Mississippi River to overflowing and any houses that were sitting low or had basements were in danger of taking on water. When the calls began pouring in to the local SERVPRO franchise, he was quickly overwhelmed. SERVPRO Corporate declared the area to be an official “storm” and rang the bell for help. The advantage of being part of the SERVPRO franchise system is that in times of crisis, additional aid is only a phone call away. SERVPRO franchises from across the country responded to the alert, including SERVPRO of Santa Barbara. It took our crew two days to drive from Santa Barbara to St. Paul but once they arrived they hit the ground running. Long days of helping people with their water damages made the trip worthwhile and we were proud to be able to offer our assistance. When disaster hits locally, please give SERVPRO of Santa Barbara a call at 805-963-0606. It sometimes looks pretty but you definitely do not want mold in your new home. Spring is officially here and spring is known in the real estate business as the start of the selling season. According to Housingwire.com, since 1999, non-seasonally adjusted existing home sales have increased by an average of 33% between February and March. The sales continue to ramp up during the spring and summer months before trailing off in the fall and winter. Most prospective owners involved in the process of buying a home understand that some renovations may be necessary, but aren’t prepared for hidden moisture and mold damage that can significantly escalate repair costs. Unfortunately, this kind of oversight happens repeatedly during home buying transactions because home inspectors cannot see behind cabinets or walls, so often the sources of trouble are not found until after the sale. This common oversight causes many new owners to make wrongful assumptions during their purchase, potentially costing them significant expenses in unplanned renovations. When it comes to uncovering hidden mold, your best weapons as you are looking around a house you are considering purchasing are a good sense of smell and a strong flashlight. If your nose detects the familiar musty aroma of mold, try to see if there is an obvious place where you can see it. Use your bright flashlight to take a good look under sinks and behind furniture. If any mold pops up, make sure to bring it to the attention of the home inspector you hire to do your pre-purchase inspection. If he can find the source of the mold and the current owners can get it fixed, you can save lots of money on future remediation. 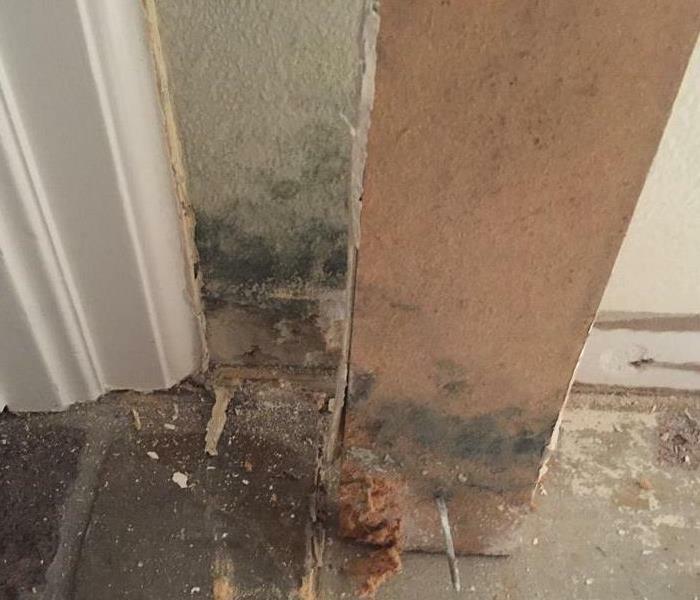 If you do purchase a home that comes with a side of mold, feel free to contact us here at SERVPRO of Santa Barbara to fix that for you fast. We can be reached any time at 805-963-0606. The recent wildfires have been occurring with such regularity you would think that your business is more likely to suffer a fire loss than a water loss. According to FEMA though, your business could in fact be as much as ten times more likely to be damaged by water than by fire. This rainy season is driving home that point with rainfall above our expected annual totals. Fortunately, most of the rainfall that we have had has fallen at manageable rates. Even still, there are businesses that have been harmed by flooding. If your office has been safe in the past, new construction of buildings, roads or bridges can alter the flow of water, increasing the potential for flooding. Living in a high-risk flood zone can increase the likelihood of experiencing a flood, but being outside a high-risk zone does not mean flooding is not possible. Have your important equipment above the expected flood levels of your area. Have ready emergency building materials if you live in a flood-prone area. These may include plywood, plastic sheeting, lumber, nails, shovels and sandbags. Listen for alerts via radio, television or text for the latest storm information. Be sure to keep your smartphone charged in the event you lose power so you can still receive alerts or call for help. If advised to evacuate, shut of all utilities and evacuate immediately. Do not return to your business until authorities indicate it is safe to do so. Once allowed back into your office inspect it for damage. If your property has been damaged, promptly report the loss. Throw away any food that has come into contact with floodwaters. Use dehumidifiers and air conditioners to keep air moisture between 30 percent and 60 percent, especially when the weather outside is humid. Fix small leaks immediately. This can be easier said than done if the leak is hiding behind drywall but be observant for signs of moisture. Home insurance policies tend to not cover mold remediation if the mold resulted from a preventable water leak. Also in that category, home insurers typically will not pay for maintenance issues that they think a homeowner could have, and should have, prevented. Insurance companies will expect you to be proactive and fix any of those problems prior to your filing a claim. If a pipe or a water supply line suddenly bursts inside your home, there isn’t a lot of time before the water can travel from your kitchen to the hallway to the dining room and beyond. Floors get wet, walls get wet, cabinets get wet and before you know it you have an official water damage that can be very expensive and time-consuming to deal with. Would you know what to do if this unfortunate situation ever happened in your house? Well if it does, the first thing to do is to get the water to stop flowing. If the situation is as we described above, you will need to shut off the water at the main water shutoff to your house. The secret to success here is to know the location of the turn-off prior to the damage occurring. Here in Santa Barbara, you will typically find your water shutoff in the front of your home and it is usually located near an outside faucet. Once you have found it, it is as easy as pulling a handle into the off position or turning a valve clockwise until the water stops flowing. Of course, the shutoff valve could be someplace else so it is definitely worth your time to find out where yours is located before an emergency arises. After things calm down and it comes time to clean up the mess, feel free to give us a call at SERVPRO of Santa Barbara. We are always here to help. SERVPRO of Santa Barbara can be reached at 805-963-0606. Storms can occur at any time of year but here in Santa Barbara, they tend to occur in the winter. We have been stuck in a drought for so long we forget that February can be a cold and wet month. This February happened to be the first February since they began record-keeping where the temperature did not reach 70 degrees and that is the Santa Barbara version of a Polar Vortex. The rainfall in February has been considerably above average which has been great for replenishing the reservoirs and ground water but it has also presented its challenges. Heavy rains can cause flooding and we are in a situation still where vegetation has not had time to grow back after last year’s Thomas Fire. When it rains hard enough, the water drags mud and debris down the slopes of our nearby mountains and deposits them anywhere in its path, including people’s houses. Getting a water damage at your place of business is never convenient. With the recent rains, however, many local businesses found themselves facing just that inconvenience when they arrived at work. Business owners know that they must deal with the wet walls and floors but the question then becomes, how do I keep my business open while the emergency is handled? Fortunately, SERVPRO of Santa Barbara has significant experience in this area. We take special care so that if it is possible to keep your place of work open, we help you to navigate the obstacles and keep your business in business. When a local realtors office came to work last week, they found that their carpet was soaked and drywall had gotten wet from flooding on their street. They called SERVPRO of Santa Barbara and asked if there was a way to keep their office open while we did our work. The office had an open layout and they feared the noise from our equipment would be too loud and would blow away their paperwork. Our talented crew immediately went to work setting up a full floor-to-ceiling opaque containment which kept our equipment out of sight and noise to a reasonable level. The containment served double-duty by reducing the volume of air in area of the water damage which helps to speed up drying time. In the end, the realtors were able to keep working and the water damage was dried without major interruptions to the business. If you see water damage at work, contact SERVPRO of Santa Barbara any time at 805-963-0606. After the Thomas Fire, soot found its way onto everybody’s houses. For most people, if they wanted their home to be cleaned, it was simple enough to aim a pressure washer at the roof and walls and rinse it off. Even for the folks that did not want their homes cleaned, the wind and rain took care of much of the cleaning work eventually. One day though, we received a phone call from a woman in the hills above Santa Barbara. Her home was made of adobe bricks and the soot had left staining. Pressure washing was not an option because the bricks are fragile and porous. Fortunately, here at SERVPRO of Santa Barbara, we are able to tap into the long list of resources available to the SERVPRO franchises. That list includes the Professional Cleaning Staff and chemists at SERVPRO Corporate. When in doubt, these experts are only a phone call away and there is rarely a situation that they have not already seen. We were able to contact the Cleaning Staff and together we devised a method to clean the adobe. Our technicians did not have a ton of experience with this task but what they did have was access to knowledge which is just as valuable. 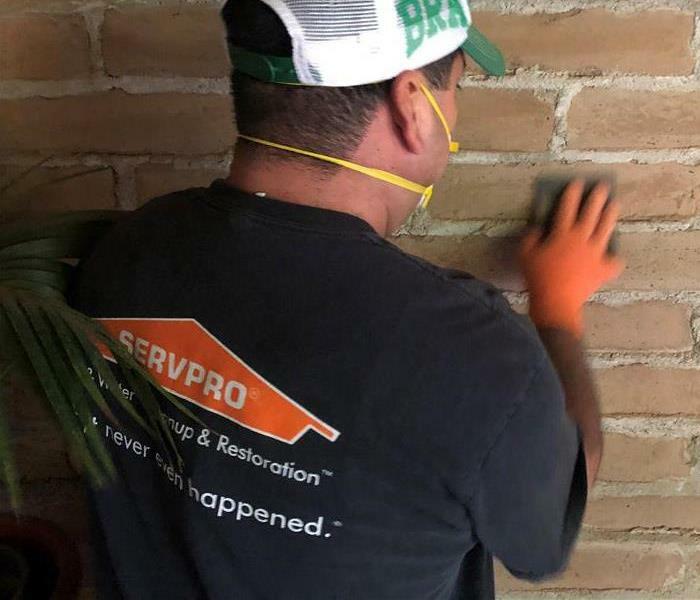 In the end, the customer was impressed with how hard-working the professionals from SERVPRO of Santa Barbara were and she was quite pleased with the end result. That is why people choose SERVPRO. We try not to say “no” and if we can figure a way, we will get it done. If you have a job that has been vexing you, give us a call at 805-963-0606.